Nearly every major city in North America and Europe is now home to a baroque orchestra playing on period instruments. Large-scale organizations including Toronto’s Tafelmusik, Boston’s Handel and Haydn Society, San Francisco’s Philharmonia Baroque, Montréal’s Ensemble Arion and Houston’s Mercury Baroque have built themselves into major players in the cultural scenes of their respective regions. This success has created new and exciting opportunities for musicians and audiences alike. Over the last few years, a critical mass of world-class musicians experienced in baroque period performance have also moved to the west coast. This is translating into a more active professional scene in this repertoire throughout the whole region. As a result, we feel that the time is right for UBC to provide students with regular access to these musicians and their skills. Students who add this knowledge and experience to their resumes will see more opportunities to work professionally wherever they decide to live. To this end, the UBC School of Music, the Pacific Baroque Orchestra (PBO), and Early Music Vancouver (EMV) have established a Baroque Orchestra Mentorship Programme that is open to selected students who are taking Music 157A/557 Early Music Ensemble (EME) as well as to selected members of the professional community wishing to learn about period performance practice. This new initiative is aimed at increasing the long-term sustainability of the local period instrument scene. This programme is generously supported by Vic and Joan Baker. Students rehearse weekly over each academic term at UBC with a core group of five professional musicians led by internationally renowned conductor and harpsichordist Alexander Weimann. The rehearsals will lead to an end-of-term concert in each semester where students and professionals will perform side by side. The EME and Mr. Weimann have recruited a select group of students to register in the year-long course and participate in the programme. Instruments have been made available for loan to all participants through the UBC School of Music and Early Music Vancouver instrument collections. Membership in the orchestra comes with a free subscription to both the Pacific Baroque Orchestra’s season and Early Music Vancouver’s Masterworks at the Chan Centre. For more information about the Baroque Orchestra Mentorship Programme, contact Alex Fisher at the coordinates below. Violinist Chloe Meyers is a regular guest leader and orchestra member of baroque ensembles all over North America. She has worked with ensembles including Les Violons du Roy, Tafelmusik, the Montreal Symphony Orchestra, Ensemble Les Boréades, the Theatre of Early Music, Les Idées Heureuses and Les Voix Baroques. She recently joined the Pacific Baroque Orchestra as concertmaster and will continue to play principal second with Arion Baroque Orchestra in Montreal. Most recently she played first violin on a Juno Award winning recording of Handel arias featuring Canadian soprano Karina Gauvin on the Atma Classique label. 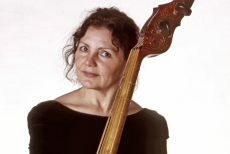 Natalie Mackie studied cello at the Conservatoire de Musique (Québec), followed by a degree from the UBC’s School of Music, where she was introduced to the viola da gamba. She pursued further studies at the Koninklijk Conservatorium in The Hague. Natalie has played with many ensembles in Canada and the US, including New World Consort, Les Coucous Bénévoles, Tafelmusik, the Portland and Seattle Baroque Orchestras, Les Voix Humaines, Tempo Rubato, Les Voix Baroque, Oregon Bach Festival Orchestra, Victoria Baroque Players, and the Vancouver Intercultural Orchestra among others. Natalie is a member of Pacific Baroque Orchestra and the chamber ensemble La Modestine, both Vancouver-based ensembles. She has toured throughout Canada, Europe, and the US and recorded for Radio France, German Radio, BBC, CBC, and NPR, as well as the Canadian label ATMA Classique. Natalie is a regular performer in the Pacific Baroque Festival, held annually in Victoria, BC, and teaches in the Baroque Orchestra Mentorship Program at the University of British Columbia.